What do you do if you have a racing bike and want to do a nice little weekend tour? Well, you can send the frame back to the builder for eyelets to mount a rack and then mount said rack with some small panniers. But why spend a fortune? 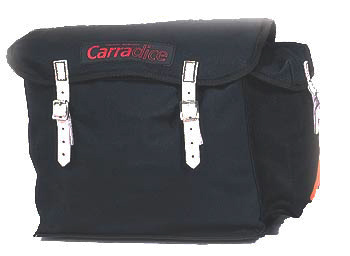 You can just get yourself a Carradice saddle bag. They come in several sizes. Unless you'll be tent camping the "Camper Long Flap" model will carry more than most folks would want to bring along on a weekend jaunt. The Nelson Long Flap is a bit smaller than the Camper, and probably ideal for most weekend trips and brevets. The Lowsaddle Long Flap is for small bikes where there's not much distance between the saddle and the rear wheel. The Junior Saddlebag is perfect for day rides when the weather is at all questionable. With the larger Carradice bags, you'll probably want a little extra support to keep the bag from flopping around back there. 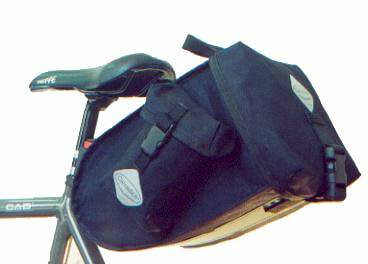 For more info on some of these saddlebags, go to the Carradice Web Site. My most popular saddlebag. The Nelson Longflap will hold just about anything most folks would want to carry on a bicycle. This is the Nelson Longflap mounted with a Bagman support on my Rambouillet. Two side pockets are great for inner tubes, tire irons, and the occasional peach. 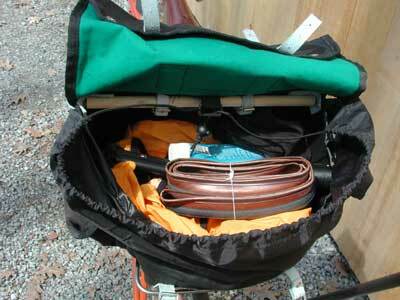 The two loops on top are optional straps that can hold a wet jacket after the rain stops. No point in stuffing it back inside where it will get everything else wet. Why is it called a "Longflap"? Glad you asked. The flap has an extension that normally folds underneath. With it folded you cinch the flap down with the upper set of straps. With the flap extended, you use the lower set of straps. 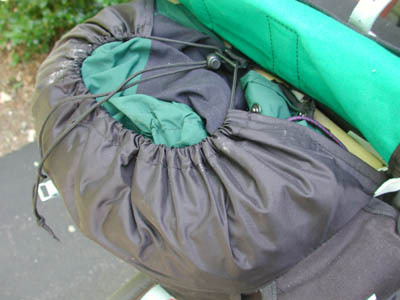 A drawstring pulls the nylon fabric surround tight. You can just see the wooden stabilizing dowel up front. There are two straps that wrap around the dowel and through the loops on the back of my Brooks B17 saddle. The attachment couldn't be simpler. It's a terrific combination of old and new design. Now available in both black with white leather straps as pictured, or in green with brown leather straps, as pictured below. See the Barley. Can accept outside straps for holding a wet jacket after the rain stops. Looks just like a Nelson Longflap and has all the same features, only shorter to fit bikes when the saddle is positioned lower to the frame. Can accept outside straps for holding a wet jacket after the rain stops. Now available in both black with white leather straps as pictured, or in green with brown leather straps, as pictured below. See the Barley. Identical to the Nelson Longflap above, but without the flap extension and extra straps, so you save a little money. Can accept outside straps for holding a wet jacket after the rain stops. Now available in both black with white leather straps as pictured, or in green with brown leather straps, as pictured below. See the Barley. Like the Nelson, but without the side pockets. Otherwise it's identical to the Nelson. You can add outside straps for holding a wet jacket after the rain stops. Now available in both black with white leather straps as pictured, or in green with brown leather straps, as pictured below. See the Barley. 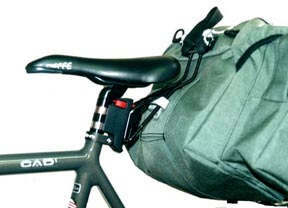 There are two straps that must wrap around a wooden dowel inside the saddlebag, then go out of the bag through holes in the fabric which are spaced just wide enough apart to align with the loops on the back of a Brooks B17 saddle, (or a Carradice clamp) and then go back inside the bag. So, start with the straps inside the bag. When you're finished the strap buckles should not be outside the bag. If they end up outside the bag, you can't get the bag attached tightly enough, and it will wobble around back there. Slide the end of the strap through the hole in the fabric, then through a loop on the saddle, then back through the hole in the fabric and around the dowel. Pull it tight, buckle the strap, repeat the process on the other side and you're done. For some strange reason, there are several internet web sites showing how to mount these bags to saddles with loops. And they all show the leather straps with the buckles outside of the bag, between the bag and the saddle lops. This is silly, since the longer distance that results between the bag and the loops can only result in more movement between the bag and the loops, allowing the bag to sway. Pay no attention to those other web sites. Do it my way. Harumph! This is all you should see of the strap outside of the bag. What you're seeing is the rear part of my Brooks saddle and the leather reinforcement (it's stitched to the fabric, you can see the stitching) around the hole in the bag's fabric. The strap comes up out of the hole, through the loop on the back of the saddle and back down through the hole. Here's the view inside the saddlebag. 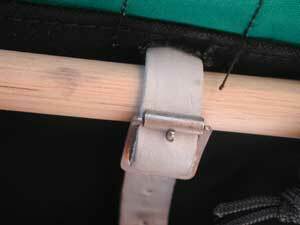 You can see the wooden dowel and the strap and buckle. Remember, the buckle must be inside the bag. 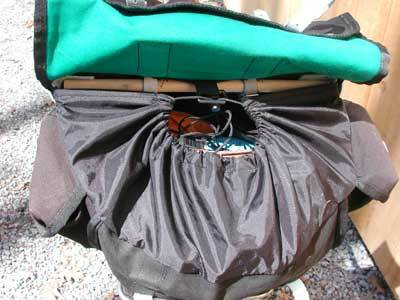 If it's outside the bag, you can't get a nice tight fit up against the saddle loops. 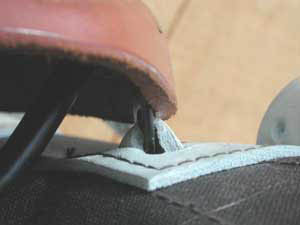 You want the wooden dowel to be as close as possible to the saddle loops, and having the buckle outside prevents that. Place the buckle inside. And make it as tight as you can. The tighter it is, the less the bag will move. Here's another view of the inside of my Nelson Longflap. The nylon surround is loose for loading and unloading the bag. And now the surround is pulled tightly shut with the draw cord. 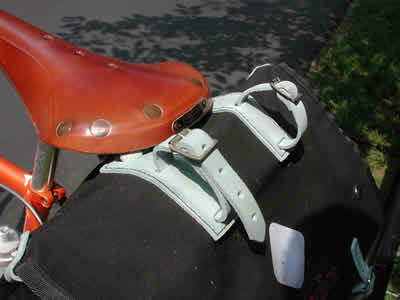 Three leather straps are included to mount the bag on the saddle and seatpost. 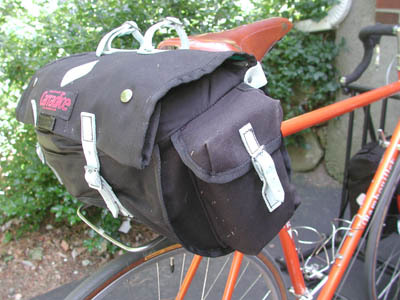 Most saddlebags can have additional straps added to carry a wet jacket or whatever. The exceptions are the narrow bags; the Junior and the Pendle. They lack the loops for holding the outside straps. Extra leather straps are listed below. Remember, the straps you see here on top are not included with the saddlebags. 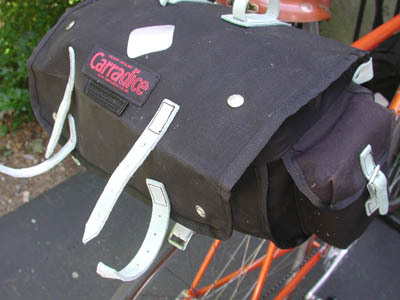 You can attach your Carradice saddlebag directly to your saddle and seatpost with the straps on the forward side of the bag. But when you want to remove the bag from the bike, you either have to pull the seatpost out of the frame, or unbuckle the bag from the saddle and post. There is a better way. The Carradice SQR or "Seatpost Quick Release System" attaches to your seatpost and allows you to quickly remove your Carradice bag from your bike. 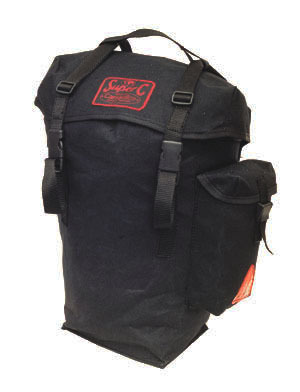 The SQR won't provide as rigid a support for your bag as the Saddlebag Support, since it lacks the lower platform. 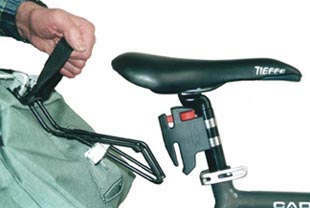 But if you've been perfectly happy with the way your bag feels on the bike when mounted directly to the saddle and post, and just want to make it easier to remove the bag when stopping for lunch and whatnot, the SQR may be just what you need. It will also move the bag a bit further from your thighs and raise it away from the tire. 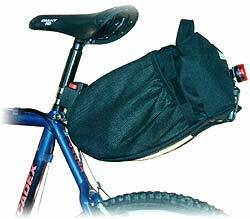 It will prevent the bag from interfering with your cantilever brakes as well. The SQR mount is held to the seat post with two stainless steel bands. While the bands are quite strong, they can be damaged if you overtighten them. When mounted to an aluminum seat post, there should be no problem, since you don't have to tighten the bands that much to keep the mount from slipping. But on a steel post, the mount doesn't grip very well, the chrome plating being rather slick. So I don't recommend using the SQR on a steel seat post. But on aluminum seat posts (which have a "stickier" surface), they work very well. The SQR will allow you to carry up the 22 lbs or 10 kilograms in your bag. 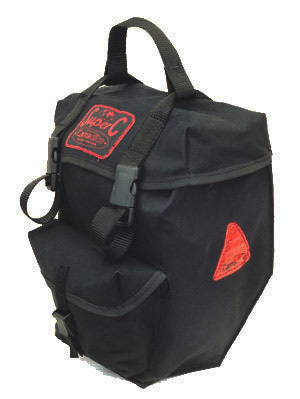 Carradice makes a series of saddlebags that have the SQR System built in. It comes with everything you need. Extra SQR clamps are available if you would like to easily move the bag from one bike to another. The SQR bags are really convenient to use. You can take them on and off the bike easily, and you have quick access to your gear. Since the weight is carried further back, you'll feel it a bit more while climbing out of the saddle. The SQR mount is included. Carry up to 22 lbs. About once a month I get an email asking me if it's safe to use a Carradice saddlebag or SQR on a bike with a carbon fiber seatpost. Now, I don't mean to be insulting but, if you have to ask that question, why would you want to have a carbon fiber seatpost in the first place? For the record, I haven't the slightest idea whether your carbon fiber seatpost is safe or not. And I would suggest that if you're concerned about your carbon fiber post breaking, you may want to get rid of it. If it did break, you would be left with a stump of carbon fiber pointed up towards your crotch. Carbon fiber, when it breaks, leaves an extremely irregularly shaped and extremely sharp surface, much like a glass bottle with the top broken off, but much more irregular. The damage it could do to a human's genitalia is too gruesome to discuss. The cape and the spats are now out of stock for good. We do still have Pro Route Helmet covers available. 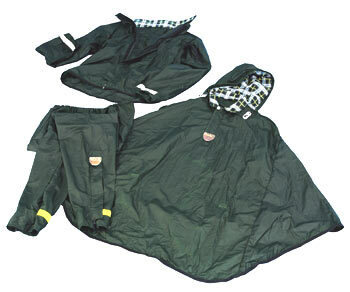 This photo shows the Duxback Poncho, Pants and jacket. DUXBACK SPATSThese feature an over knee fit, adjustable fastening at top and bottom and an elastic stirrup suitable for use with cleats. One size fits UK shoes sizes 7ó11. A matchingDUXBACK HELMET COVERis available with wide ScotchliteTM reflective strips. 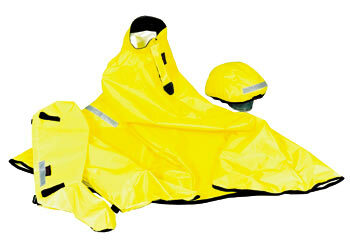 DUXBACK OVERSHOESin medium (sizes 4-7) and large (sizes 8-11) sizes complete the range of Duxback rainwear. Hi-viz reflectives front and rear. The official Carradice website is here. For other packs see my Ortlieb and Berthoud pages. Sometimes the volume of email is so great we can't get to it all. For important communication, please phone, or phax. Under no circumstances should you place an order without first reading this.